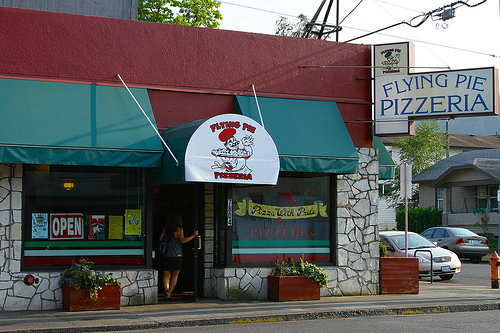 Flying Pie Pizzeria has several locations in Oregon. In mid-June, I met a friend for lunch at the Portland location on SE Stark St. He mentioned it was one of his favorite pizza spots. Who am I to turn down pizza? The place opens at 11 for lunch. My friend and I got there around 11:20, and it appeared a large group decided to have a party that day. Personally, I didn't mind. To me, it's a great sign if business is booming. We split a 14" Hawaiian pizza (Canadian bacon and pineapple), going with the X-Thin crust. We added the Italian seasoning and fresh garlic at no extra charge. A rather generous pile of toppings awaited us. No shortage of protein and fruit here! I'll be honest, I was expecting an even thinner crust when seeing the X-Thin option. Regardless, it was very good. I still managed to get the slice folded, with my unforgiving panda jaw taking down slice after slice. I'm a huge fan of the Italian seasoning and fresh garlic options. Just a refreshing feel to the pizza that made me want more. I was tempted to try the salad bar. A rather small station of several salad components (with a few dressing choices) made for a rather average-looking spread. Glad to see honey mustard dressing; I love that stuff.